WILLIAM NATHANIEL SOMNGESI was born at Grahamstown in 1852. His father was a diligent evangelist among the Wesleyans. His maternal grandfather was one of the first converts after the Fingoes were released from the Amaxosa servitude by the British Government in 1835. This grandfather was also a zealous evangelist, greatly respected and trusted by the natives. William, therefore, came of excellent ancestry. He received a good early training in the Wesleyan Day and Sunday Schools at Grahamstown, under Mr. Berkitt, a great composer of music for Kaffir hymns. He thus received a thorough musical training, which was of great use to him in his after ministry. From 1865 to 1868, he lived at home on a farm with his father. Then he went to Alexandria as an interpreter in the Magistrate’s Court, and later on he worked in a general store at Port Elizabeth. Here he joined the Church and soon became a Local Preacher among the Wesleyans, In 1875 he returned to Grahamstown as a teacher in the same school in which he had been educated. He left in 1880 to go to Heald Town Training Institution to further improve his education. After two years there, he took a school at Mxumbu, in the King Williams Town District. Since leaving Port Elizabeth, he had continued to do a lot of preaching, which was a work dear to his heart. It was while teaching at Mxumbu that he was invited by the Rev. J. Smith to become our teaching evangelist at Rouxville (twenty-two miles from Aliwal), having been highly recommended by his Superintendent, the Rev. Sergeant. Somngesi had previously offered himself for the Wesleyan ministry, but his health was against him as he had inherited asthma from his father, and the down- country climate was much too damp for him. The dry and exhilarating climate of the Free State suited his complaint and much prolonged his days. He had previously married a sister of Rev. John Msikinya, our native minister at Aliwal. She was a good, though, quiet worker. 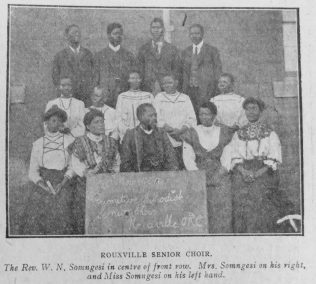 Somngesi was our teaching evangelist from 1885 to 1891, when he entered our ministry, and after passing through the usual probation, was ordained in 1895. This largely increased his influence and power for good, and it was chiefly to his energetic initiative that we owed the wonderful progress of the Orange Free State side of our Aliwal Mission. Besides carrying on the complex work of Church and School (including Day School) at Rouxville, he visited Smithfield (twenty-two miles), Zastron (twenty-four miles), and Bushman’s Kop (thirty miles) every quarter for Sacrament Services; and Wepener and Jammersberg Drift (sixty miles), once every six months. For this purpose he kept a Cape cart and pair of horses (or mules, after the war). He was very keenly interested in the development of our Zambesi Mission, and offered himself for the work, but the doctor would not pass him owing to his chest complaint. This was a great disappointment to him, but ours was the gain – if he could not go himself he helped to influence and train some who did go. Mr. Somngesi bravely stuck to his post during the Boer War and had a rough time in consequence. He helped the English as much as he dared, and had native runners who carried any important news to the commandant in the Herschel District. It was thus that he helped to save our Aliwal bridge – the only one over the Orange River, which was not damaged during the war. He heard of a load of dynamite being despatched to Aliwal, and guessing its purpose, he sent a runner (one of our Rouxville members) to the English Commandant, who at once sent an express rider to meet General Brabant. In consequence a section of his Colonial Division came up by forced marches in time to drive the Boers back and save the bridge. 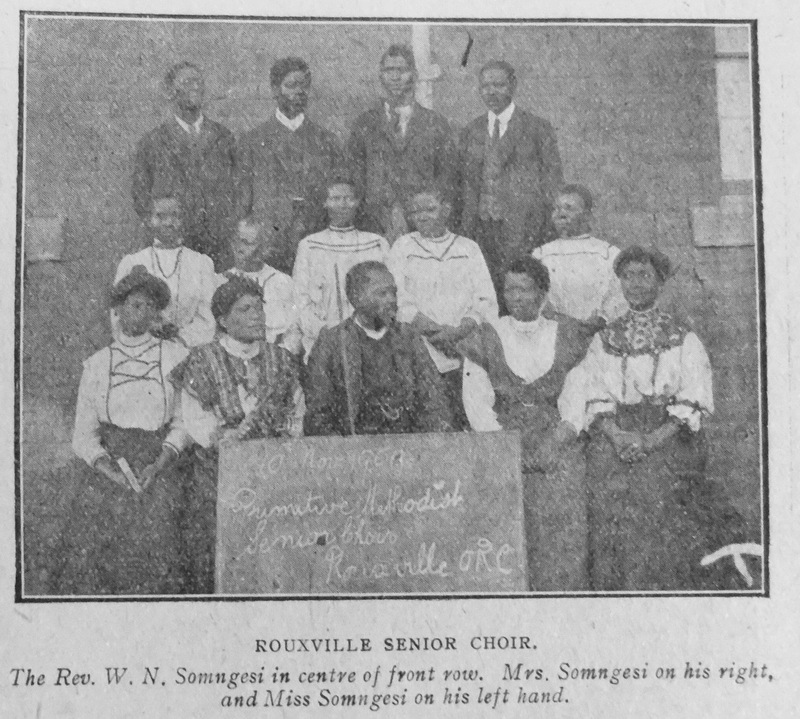 I always greatly enjoyed going over to Rouxville and helping Mr. Somngesi with his Sacrament Services. We had interesting converse and sweet fellowship together, and I was always entertained very cordially and comfortably in his home. He was a very keen musician, and he would scarcely wait for the news before I had to sit down to his organ and play many tunes for him out of our hymnal, etc. Then he would have the organ taken into the Church for the Sunday services. I played and preached while he did the rest, and when the natives got properly going on a good old-fashioned tune (such as “Sagina”) that they liked, the organist was swamped. In all my varied experience, I have never enjoyed playing the organ so much as I did for Mr. Somngesi and his services. (The picture shows him with his Senior Choir – they had a Young People’s Choir as well, and I often assisted him at his concerts). In character, Mr. Somngesi was finely distinguished by his simple and direct earnestness and practical wisdom. He was the most common-sensed and level-headed native I have ever met. He had both a keen financial conscience and genius for orderliness. In consequence he was never in debt, and his books were well and accurately kept. He was a diligent student and wide reader, and a preacher much beyond the average in Sexosa, Sesuto, Dutch and English. This they showed by attending his funeral in large numbers, which was an unparalleled tribute for Dutch people to give to an educated native, proving as it did that his sterling character had entirely subdued their prejudices. We had hoped that he would have been spared to visit England as he richly deserved such an honour, but instead he was promoted to “glory,” which was far better for him, if not for those left behind to sorrow over his loss. It is impossible to exaggerate the importance of native ministers and teachers like William Nathaniel Somngesi. It will only be when the numbers of such labourers are multiplied by the hundred and thousand that the African Continent will be won for Christ. This is the crucial problem of missionary advance, and the modern policy of Missionary Societies in the institution of training schools is the policy that promises the richest and most fruitful product on the fields. This policy has been vindicated under our own missionary auspices. The training school at Aliwal has vindicated itself again and again. In the more recent years the Cron Training Institution has furnished the most efficient and ardent workers. It would have been impossible to have entered all the open doors in Nigeria if we had not had these consecrated and educated and spiritualised native teachers and preachers. The conversion’ of one native youth, may mean the winning of thousands to Christ.